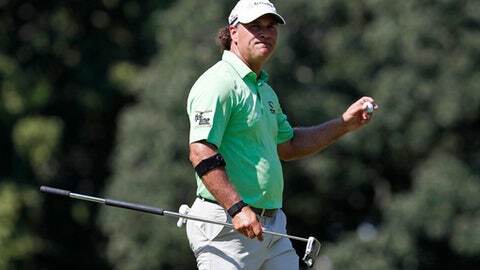 MADISON, Wis. (AP) Scott McCarron won the American Family Insurance Championship on Sunday, closing with an 8-under 64 for a one-stroke victory over hometown player Jerry Kelly. The 52-year-old McCarron birdied Nos. 14-16 and parred the final two to hold on for his first victory of the season and seventh in three years on the PGA Tour Champions. He finished at 15-under 201 at University Ridge. McCarron looked forward to the stretch of three straight major tournaments that begins Thursday with the U.S. Senior Open at The Broadmoor in Colorado. Kelly shot 65, also parring the final two holes. Kelly joked about friend McCarron paying him back for a friendly match with McCarron’s wife. Fellow Madison player Steve Stricker, the tournament host and first-round leader, had a 65 to tie for third with 2017 champion Fred Couples and Colin Montgomerie. Couples had a 67, playing alongside McCarron. Montgomerie followed a second-round 72 with a 64. Paul Goydos (67) was 12 under, John Daly (67) topped the group at 11 under, and Bernhard Langer (69) was another stroke back. University of Illinois coach Mike Small, Stricker’s teammate with the Illini, birdied the final hole for a 68 to also tie for 10th at 10 under. Second-round leader Esteban Toledo had a 73 to tie for 24th at 8 under.